Memories of a glorious childhood spent in Kolar Gold Fields. KGF was known for its colonial ambience and came into existence as early as the 16th century. A Testimonial on Kolar Gold Fields Down Memory Lane - Asad Khan Omran (President), Omsunz Financials Inc., California, U.S.A.
ALL CONTENT ON THIS BLOG IS THE SOLE COPY RIGHT & PROPERTY OF BRIDGET WHITE-KUMAR. PLEASE NOTE: NO ARTICLES, PHOTOGRAPHS, INFORMATION OR PART THERE OF, of this SITE / PUBLICATION may be reproduced, stored in or introduced into a retrieval system or transmitted in any form, or by any means, electrical, mechanical, photocopying, recording or otherwise without the prior permission of the owner of this blog as any copying without permission will amount to Plagarism and infringement of Copy Right. The Boy Scouts Movement was started in India by the British as early as 1909 in Bangalore but it was open only to British and Foreign Scouts. In 1916, the Indian Boy Scouts Association was founded and was open to all Indians. In 1929, Mr. V.N. M. Felix, who was a Malaria Inspector, attached to the Sanitary Department, Champion Reefs, founded The 5th Kolar Gold Fields (St. Mary’s) Open Scout Group, that functioned from the Champion Reefs Scout Den until the late 1980s. 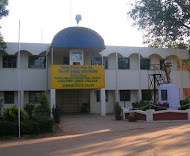 Scouts from this Den attended many state and national level camps under the leadership of Mr. Felix. Scout meetings were held regularly on Saturday evenings. The Scouts and Guides movement in KGF was quite active under Mr. V.N.M. Felix, who was the Scout Master in KGF. He was a short thin man with a huge white mustache. He wore his khaki shorts and shirt and the Scouts tie, scarf and stockings with pride. Besides, training the young boys to be scouts he also started the Bulbul Movement for the girls. Mr.S. A. Bayley, a British Officer, who was the Chief Cashier and Accountant in Nandidroog mines was the Vice-President, K.G.F. District Scout Association in the 1940s and 50s. His contribution to the growth and popularity of the Scout movement in K.G.F. was significant. In 1946 he was awarded the ‘Silver Elephant’ (which is the highest award in Scouting in India) by the then Chief Scout His Highness The Maharaja of Mysore! The Boy and Cub Scout Movement was active in the K.G.F. School up to the 1950s then went into decline. In 1962, Mr. Dudley Pinto took over as the Head Master of the School from Mr. Sterling. Incidentally, Mr. Pinto was the Group Leader and District Scout Master at the Southern Railway Mixed High School (English Medium) in Khargpur, West Bengal, where he worked until 1961. In 1966 some students prevailed upon Mr. Pinto to revive the Boy Scouts group in the KGF School. Accordingly, a Scout Group with about 20 boys was formed with Mr. Pinto as Scout Master in KGF School. Mr. Felix and Mr. George Bastian of the St. Mary’s Scout Den, Champion Reefs, were closely associated with the Scout activities of the KGF School. These pictures of the 2 day Scout Camp at Bethamangala in 1967 attended by the Boy Scouts from KGF School were very kindly given to me by Mr Ravindra Kumar who now lives in Chennai when I was bringing out my book on KGF. Thanks Ravi. THIS IS AN EXCERPT FROM MY BOOK KOLAR GOLD FIELDS DOWN MEMORY LANE. 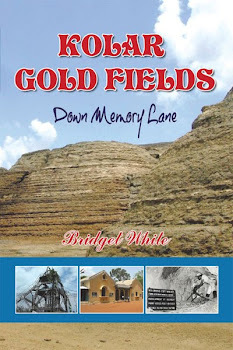 KOLAR GOLD FIELDS - DOWN MEMORY LANE is also available online at leading online stores such as Author House UK Ltd (authorhouse.com), Amazon.com, Barnes and Noble, Water Stone, Xulon, Tesco etc. 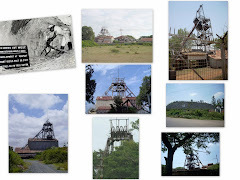 ABOUT THE BOOK "Kolar Gold Fields Down Memory Lane"
Kolar Gold Fields is a small mining town in the erstwhile Mysore State (now known as Karnataka) in India. It was owned by the John Taylor and Sons Company, a British Mining Firm for almost a century. It was well known for its Colonial ambience and was called ‘Little England’ due to its British and Anglo-Indian population. It was one of India’s earliest industrialized towns and was unique for its secular and egalitarian society. “Kolar Gold Fields – Down Memory Lane” undertakes a nostalgic journey of almost 150 years, beginning with the historical and mythological origins of the Kolar Gold Mines, its golden progress through the years under the John Taylor and Sons Company, its gradual decline, and the final closure of the once prosperous Kolar Gold Mining Company in 2003. Thus ending a golden chapter in History, which now lies buried in the annals of time. It recalls the glorious and cosmopolitan life led by the tiny vibrant Anglo-Indian Community (a living legacy of the British Raj) in the early days of KGF who lived in sprawling bungalows with beautiful gardens and domestic helpers at their beck and call. It recalls the grand Christmas Balls and Dances held at the Skating Rink and the Jam Sessions and Pound Parties in Buffalo Lodge. It finally focuses on the author's childhood memories of growing up in KGF in the 1950s and 60s, and of life’s many simple pleasures – home, family, school, playmates, entertainments, games, etc. It recalls memories of old familiar haunts and landmarks of KGF and the people who were an indispensable part of life in those days. The book succeeds in capturing and preserving the ethos and nuances of a bygone era.